Happier days? 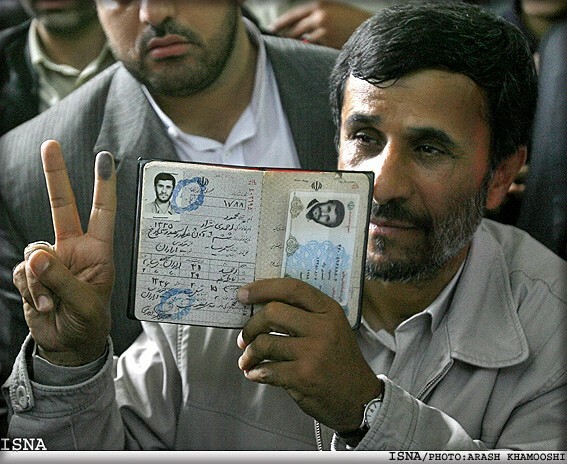 Iranian President Mahmud Ahmadinejad (right) after casting his vote at a polling station during previous parliamentary elections in 2008. The Iranian opposition didn't get their wish in 2009 when they took to the streets to contest the results of Iran's presidential election. The disputed winner, Mahmud Ahmadinejad, drowned out calls for his ouster and has remained seated as president. But nearly three years later, elections for the country's 290-seat parliament could go a long way toward determining whether his remaining time in office will be spent as a lame duck. The March 2 vote cannot unseat Ahmadinejad, of course; and with no reformist voice in the poll there is no doubt that the conservative establishment will rule the day. But it is within that establishment that cracks have emerged, and where analysts suggest that Ahmadinejad's opponents are poised to make gains. Ahmadinejad's star began to fade last year after he encroached on the domain of Supreme Leader Ali Khamenei, whose word is what ultimately holds sway in the Islamic republic. The president's attempt to exert his office's authority was successfully beaten back, and left Ahmadinejad increasingly weakened and isolated. The more traditional bloc within the conservative camp labeled the president's inner circle as a "deviant current" and accused it of undermining the clerical establishment. Some of Ahmadinejad's closest advisers were detained, while his right-hand man, Esfandiar Rahim Mashaei, was linked to a massive bank fraud. His media adviser, Ali Akbar Javanfekr, was sentenced to jail for insulting the supreme leader. Ahmadinejad himself was publicly humiliated in April when Khamenei reinstated the country's intelligence minister, Heydar Moslehi, after the president attempted to dismiss him. Now, observers believe Khamenei loyalists are determined to silence the president's faction in the halls of parliament. Washington-based Ali Afshari, a former student leader in Iran, believes Ahmadinejad's supporters will not fare well in the election on March 2. "Despite previous predictions and expectations, Ahmadinejad's allies have acted very weakly which could signal that Ahmadinejad's faction has been, in a way, defeated even before the vote," he says. ​​With no political parties in Iran, determining where parliamentarians' loyalties truly lie is a tricky business. But there are a number of signs that support the idea that Ahmadinejad's camp is not in an advantageous position. His allies running for parliament have been forced to keep a low profile in order to escape disqualification by Iran's powerful Guardians Council, which vets all election candidates. Nevertheless, many pro-presidential candidates, including more than 20 in Tehran, have reportedly been barred from running. Ahmadinejad's supporters have concentrated mostly on smaller cities and rural areas, where his power base lies. A list of the president's supporters, released just a few days before the crucial vote, does not include many prominent names. And even if they do manage to earn seats in the next parliament, according to Paris-based political analyst and journalist Reza Alijani, it is no certainty that the president can depend on their support. Alijani leaves open the possibility that some could turn against the president, as have some of his loyalists in the past. "They face two problems," he says. ​​"One is that they don't have enough manpower and candidates despite their financial and political resources. "The other is that they want to use forces from the security, military apparatus, and even if they make it to the parliament and use the government as a launching pad, they are not likely to remain loyal to Ahmadinejad, except perhaps for a few. "Their compass will be strong and turning toward the source of power: Khamenei and his office." Alireza Nader, an analyst with the Rand Corporation, reckons that, even if the president's faction holds its ground, Ahmadinejad still has little chance of regaining the influence he once had. "One of the mistakes Ahmadinejad made was to assume that he has a natural power base in Iran," he says. "He is a populist but Ahmadinejad became president really because of Khamenei's support and the support of the Revolutionary Guards Corp (IRGC).... Without their support he can't count on a lot of popular support. "I think his influence is rather limited even if he gets his allies into parliament. I don't think it's going to count as much as he would like it to." The stakes couldn't be higher for Ahmadinejad, especially considering that in the past Khamenei has signaled that Iran could move toward getting rid of the role of president altogether. Washington-based Afshari doesn't see the direst of scenarios playing out for Ahmadinejad, but he doesn't paint a rosy picture for the president during his last four years in office either. "It seems that the goal of [Supreme Leader Khamenei] and his allies is to tolerate him until the end of his presidency," he says. "But Ahmadinejad as an important current in Iran's power structure is nearing his end." According to Alijani in Paris, that is the price the 56-year-old Ahmadinejad is paying for defying Khamenei. "He resisted at first, but with the arrests and the pressure on his circle he experienced the ruthless face of power in Iran for himself." He says. "It was then, I believe, that the attempts of Ahmadinejad's clique to pave the way for securing the future presidency started to fail and the countdown to the end of his rule began."